Here, I posted better posters for Scaredy Cats & Dogs 2012. Join us later at Eastwood City at 10am! Our celebrity judges for the Pet Costume Competition are Agot Isidro, Carla Abellana, and Zia Quizon! I can’t wait to see all the furry fiends doing their best to deliver a scare. Bring your pets and bring your kids for sure they’ll enjoy. But best of all, all proceeds go to PAWS, to fund the food and upkeep of all the homeless cats and dogs in the care of PAWS. Let’s all have fun later! Hope to see you there! 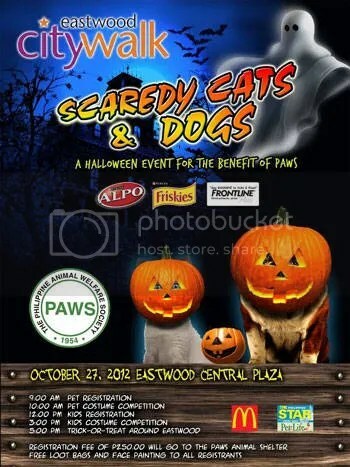 Join us tomorrow, as I host the Scaredy Cats & Dogs 2012 at Eastwood Citywalk! 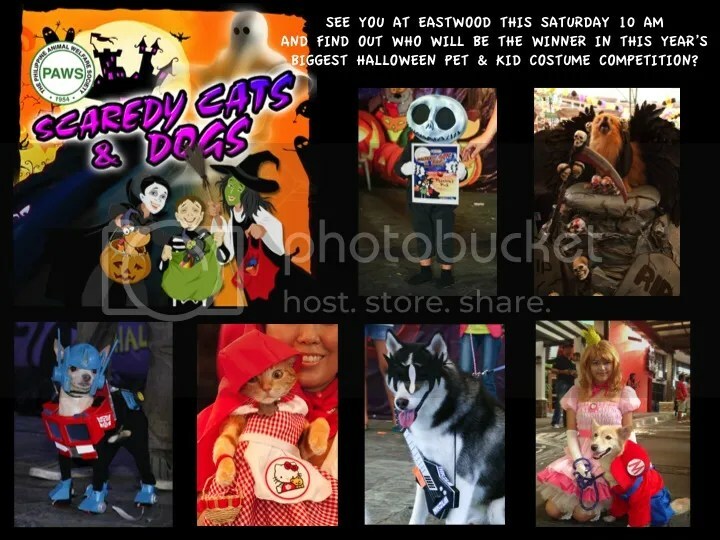 Bring your cats and dogs in Halloween costume and join our purely-for-fun competition! Celebrity judges will award the cutest and most imaginative costumes! Registration starts at 9am and the competition proper starts at 10am. Hope to see you and cutie four-footed lovelies tomorrow! It’s for a great cause, for the benefit of PAWS. Let’s show our homeless furry friends some love! 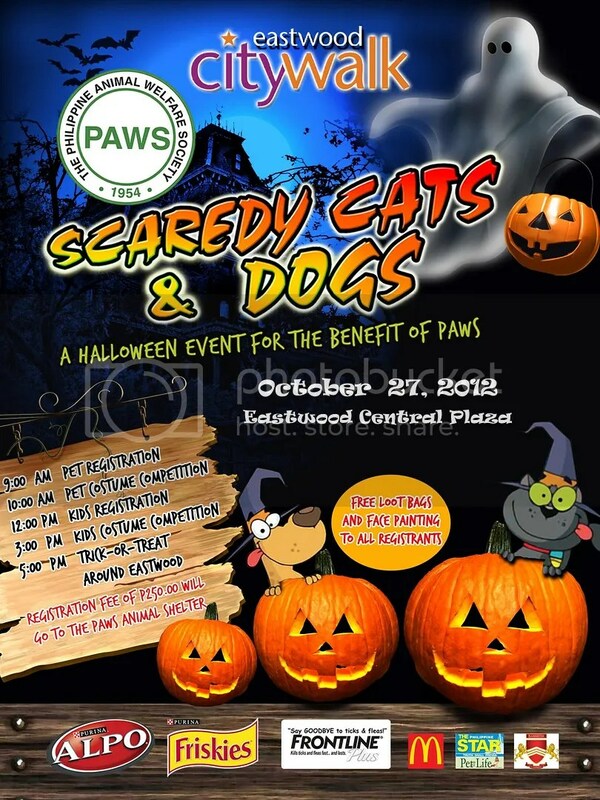 The Kikay Barkada will be hosting the 6pm concert for the benefit of PAWS! We hope you guys can join us, it’s for a good cause! For all you animal lovers out there, here’s a fun way you can make the lives of a lot of homeless cats and dogs a little easier. 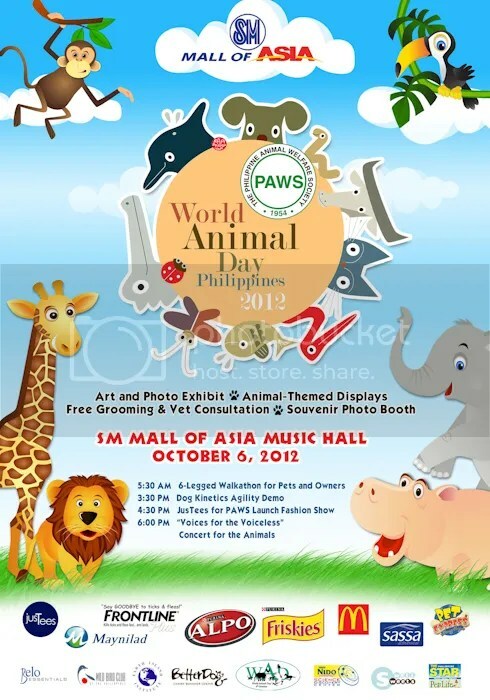 We’ll have performances by fellow animal lovers Vina Morales, Jay Durias, Regine Tolentino, Morisette, Aliya Parcs and other surprise guests! So again, hope you could join us tomorrow, October 6, Saturday, at the Mall Of Asia Music Hall at 6pm! And while you’re at it, check out the Pet Blessing happening the next day in Eastwood! Want to have a wonderful dinner date with your beloved furry babies? Check this out! 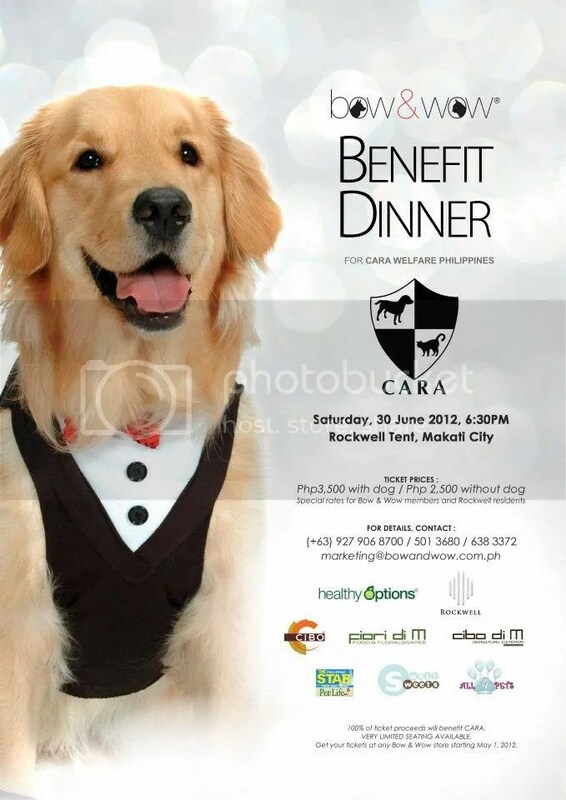 The most awaited canine event of the year — Bow & Wow Benefit Dinner for CARA Welfare Philippines — happening on 30 June 2012, 6:30pm at The Rockwell Tent. Get your tickets NOW! 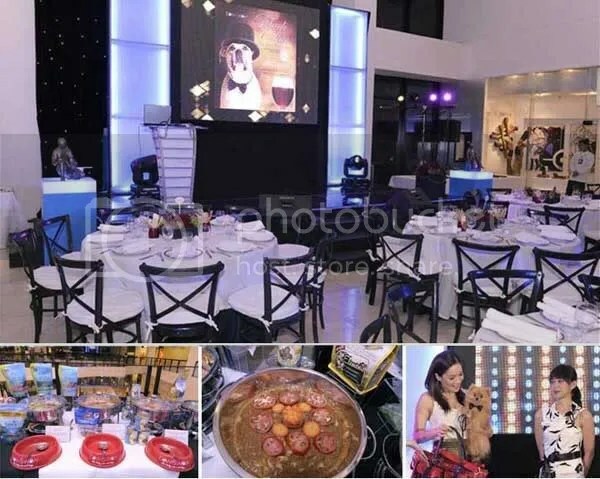 To be hosted by the highly charismatic Tessa Prieto Valdez, the Bow & Wow Benefit Dinner will feature a scrumptious human buffet by Gaita Fores’ Cibo di M, with premium French wines from Healthy Options and Wine Story, a mouth-watering dog buffet by Bow & Wow and a heavenly dessert buffet for pets by Swell Sweets. Some planned activities include: a walk of love for pet and pet parents, a show by the master magician Lou Hilario, a silent auction, a complimentary pet grooming station, and many other unique and fun-filled bonding activities for pet parents and their pets. Tickets are priced at P3,500 (with dog), and P2,500 (without dog). Special rates apply for Bow & Wow members and Rockwell residents. Tickets may be purchased at Bow & Wow stores in Shangri-la or Greenbelt 5. For Rockwell residents, tickets are available at the Grove model unit located in the Powerplant mall and Rockwell office. Plus! We’ll be raffling off a lot of exciting prizes and giving out special awards: Pawsome Twosome Award (best-dressed pet and pet parent), Wagging Tails Award (friendliest pet and pet parent), Picture Pawfect Award (most photogenic pair), Furry Family Award (cutest family). Lastly… better look your best for the camera as you mingle with celebrity guests and enjoy full media coverage from the following media partners: The Lifestyle Network, ABS-CBN, TV5, GMA-7, The Philippine Star, The Philippine Daily Inquirer, Fox, National Geographic. Tickets may be purchased at Bow & Wow stores in Shangri-La or Greenbelt 5. For Rockwell residents, tickets are available at the Grove model unit located in the Powerplant mall and Rockwell office. I. HATE. TICKS. Ticks have got to be the grossest, most disgusting, loathsome creatures that ever existed. And did I mention I HATE TICKS? I’ve had dogs since 1990, and I never had a problem with ticks. And especially with this batch of dogs, I’ve been extra careful when it comes to parasites, since all 3 dogs have tested positive for Ehrlichiosis in the past. We were successful in treating them, but we were warned that subsequent infections could prove more difficult to treat. So imagine my panic when I woke up one morning to find HORDES of these despicable parasites practically devouring our dogs! It’s as if they came out of nowhere! Like a hellspawn army of bloodsucking tiny demons. 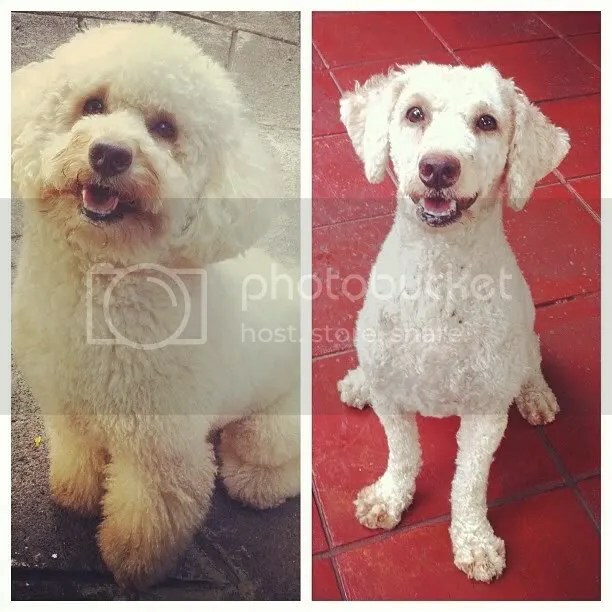 I had our dogs slathered with Frontline and the vet recommended getting them a “semi-kal” (semi-kalbo) cut, with the hair almost cropped to the skin. 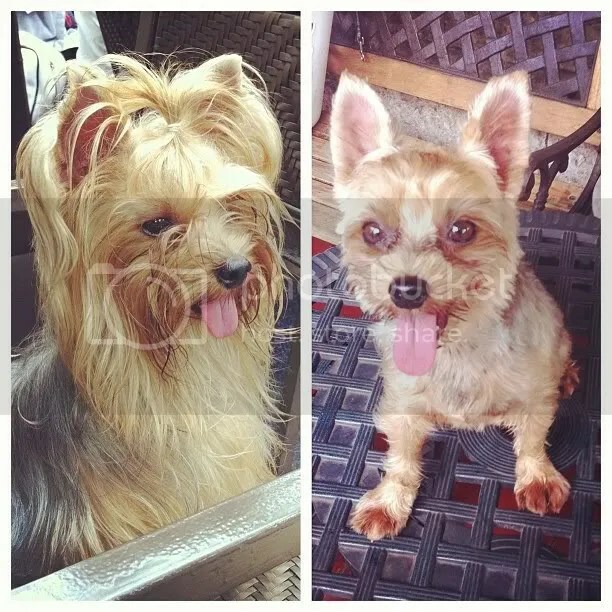 I’ve never seen how our furry dogs actually look like under all that hair. Siam looks like a giant curly Jack Russell, while Cairo looked like a rat. They couldn’t really remove all the ticks, but they’re mostly dead already. We just have to wait for them to fall off (ugh!). But even then, my concern now is the multitude of ticks in their play area, just waiting to pounce on the dogs once the Frontline wears off. They suggested different solutions. One is Asuntol, a highly toxic powder that your dissolve in water then spray all over the affected areas. But it’s hard to find now, and it’s toxic to animals, so I’d have to move the dogs somewhere else for a day or two. The vet also suggested spraying anti-tick shampoo like Axxit, which aren’t as toxic and works relatively just as well. I’m still scrounging the internet for possible safer ways to treat the area to kill the ticks and their eggs. I’m still at a loss how to purge my house of these vile creatures. Hope you guys can join us on Sunday for this event for Aspins, or Asong Pinoy (formerly askals), and will be hosting the event for PAWS. 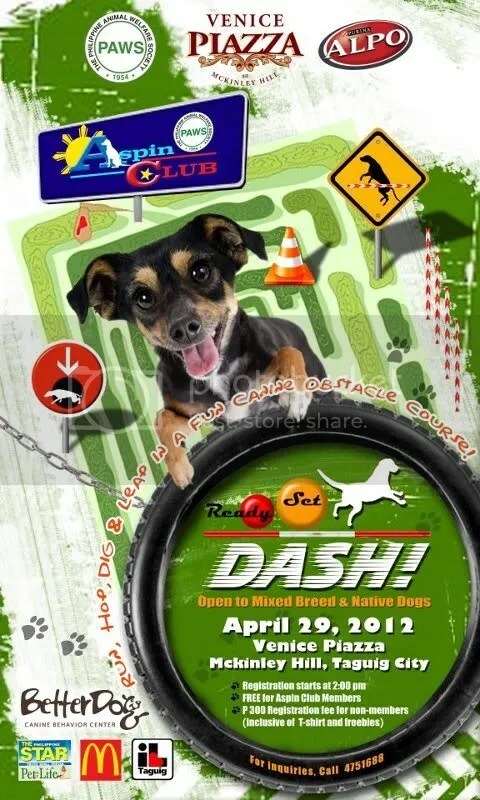 It’s for a good cause, and it’ll be lots of fun for animal lovers! Hope to see you there, 3-6pm! Bring your doggies, they’ll enjoy it too.